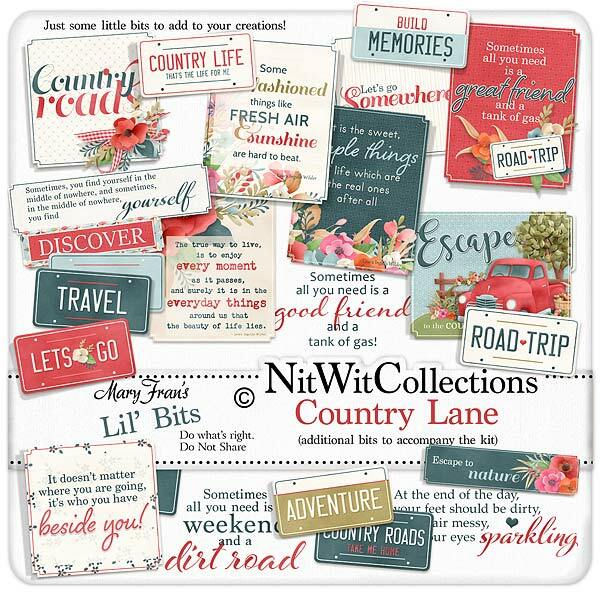 Lil' Bits "Country Lane" additional digital elements pack provides you with wonderfully designed and finished clustered elements that you can easily insert into your cards, mini albums and scrapbook layouts to achieve fabulous results without all of the work! Don't miss out on these digital elements as they are not included in the FQB "Country Lane" Collection so please don't miss out on owning and creating with these elements! 1 Journal card - "Some Old-Fashioned things like..."
1 Journal card - "It is the Sweet Simple Things..."
1 Journal card - "Sometimes all you need is a Good Friend...."
1 Journal card - "Escape to the Country"
1 Journal card - "The true way to live..."
1 Journal card - "It doesn't matter where you are going...."
1 Journal card - "Let's go Somewhere"
1 Journal card - "Country Roads"
1 License plate element - "Build Memories"
1 License plate element - "Let's Go"
1 License plate element - "Travel"
1 License plate element - "Road Trip"
1 License plate element - "Adventure"
1 License plate element - "Country Roads...take me home"
1 License plate element - "Country Life..."
1 Digital stamp sentiment - "Sometimes all you need is....."
1 Digital stamp sentiment - "At the end of the day....."
1 Digital stamp sentiment - "Sometimes all you need is a good friend...."
1 Sentiment label - "Sometimes, you find yourself in the middle of nowhere....."
1 Sentiment label - "Discover"
1 Sentiment label - "Escape to Nature"